Every time I read a real estate statistics report generated by the National Association of Realtors (NAR), I try to figure out if they are purposely misleading the public or if they are just not knowledgeable about real estate brokerage. You see, NAR likes to use data to deliver its message. Instead, wouldn't it be nice if they were to use their comprehensive database to tell us what is going on in the housing markets across the US? Here's a prime example of the problem that this poses. For years, I have been advising home sellers that it takes four to fourteen days to sell a home. The whole concept of market time (or time on the market, days on market, or days in the MLS, etc.) is based upon the pre-internet era, where multiple publishing schedules created a lag between the time one listed a home for sale and the time that the majority of prospective buyers new it was available. But content marketing and the use of critical locations on the internet allows us to reach "ready" buyers immediately, and in fact we reach more than 90% of them in just a few days. Because of this, for homes in markets with ample liquidity, market time is about four days. Period. But the recent infographic published by NAR continues to report the fluctuations in market time and it suggests that the time it takes to sell a home, right now, is 64 days. Additionally, they report 32% sold in less than a month. But is this true? First and foremost, NAR does not have the data required to calculate or estimate the number of days it takes to sell a home. Either they think they do, or worse, they know they don't but they feel that they sound authoritative by publishing market time reports every month. Either way, it's disturbing to know the brain trust at NAR is not giving Realtors or the public the analysis that we need. The process that I suspect NAR uses is to simply take the data that it receives on homes that have sold and then report the average of the "days on market" for each listing. Sounds pretty simple, how can that produce bogus findings on market time? Early in my days as a student of computer science, we were taught that garbage in equals garbage out ... meaning if you try to draw conclusions based upon faulty data, the conclusions themselves are faulty. Well, the data that NAR is using is faulty, and they likely have known it for years. I decided to measure both the mean (average) and median time it has taken for Tallahassee home sellers to sell their homes, just so that I could compare it with NAR's findings. But unlike NAR, I took the garbage out of my data. And it took a lot of work. Some listing agents keep creating new entries for their listings. This is done so that their listings show up as "new to the market" on many websites. They feel that they can trick a buyer into thinking it's a fresh new listing, but the reality is that "ready" buyers (people who have gone through the process and are now awaiting the right home) cannot be tricked, they know the market inside and out for the homes that are similar to their desired purchase. So a listing that has been on the market, but relisted multiple times, might record a final market time of a week or even zero days, when in fact it might have been on the market for months or years. These listings go right into the NAR database, while all the listings that fail to sell do not. Some listing agents create a fresh new listing whenever they put one under contract. 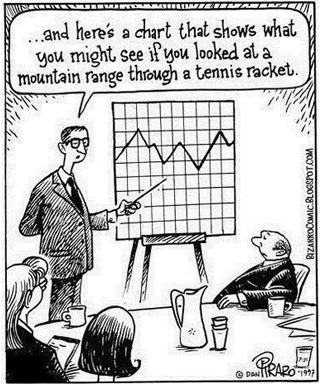 This is often done purposely to skew their own statistics. This way the home sells for "full price" and in zero or very few days. If they do this all the time, they can produce MLS reports that show them as highly effective at selling their homes fast and for full price. Some home sellers have been listed with other real estate companies prior to their current one. Very often, home sellers do not interview multiple agents before listing their home for sale, and often times they end up with somebody who is not well trained in marketing a home for sale. 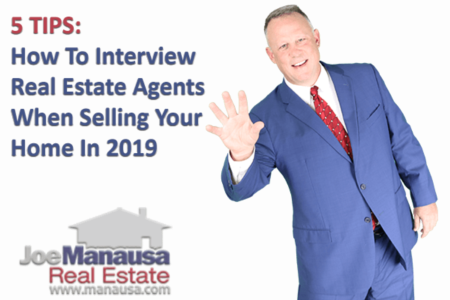 When their listing period expires (often after 6 months), they end up interviewing multiple agents and hiring a highly qualified agent for the job of selling their home. So if this agent uses one of the techniques above and sells the home after several months but reports it as one day, NAR will use the "1 day" to calculate market time. I will have the true market time for the current agent, but I just do not have the resources to scour our data and remove past real estate agents time on the market in my calculations. So my results are skewed lower because I only count the total number of days a home has been listed with its final real estate company. Some home sellers try to sell a home FSBO prior to hiring a real estate company. Much like the example above, what about a home seller who tries to sell the home on their own for a month or two, then hires an agent. I'll be able to process the total time on the market they spend with the agent, but all those days and months spent as a "For Sale By Owner" will not be part of my analysis. Nor will it for NAR either. 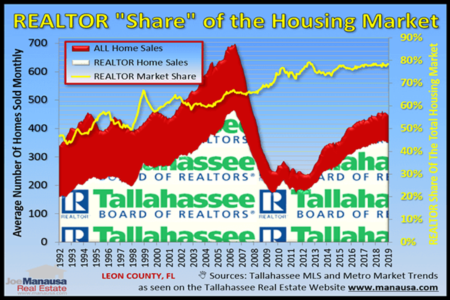 So in Tallahassee, our average time on the market over the past year, when measured like NAR would do it, is 90 days. The median market time is 55 days, which is perhaps the number we would use to compare against the 64 from NAR. But once I re-calculate the number of days a home has been "totally" listed for sale with a real estate company, the average shoots up to 116 days (January 2016). Now remember, that does not include the days that homes were listed with another real estate company or as a FSBO, and it does not count all the days that homes were listed for sale and never sold. This means that our optimistic measurement of time on the market is somewhere between 29% and 111% skewed from reality (again not counting all those other unaccounted for days on the market). We have to believe that NAR reports are no less skewed. You have to wonder why a group of very smart people would continue to produce reports on market time when they have to know that their findings are bogus. If you hire somebody who believes NAR, they will tell you that (on average), you can plan to have a contract on your home in just over two months so you should plan your move accordingly. But their advice could very well leave you frustrated with a home that seemingly nobody wants (even though there is a large market filled with buyers that are looking for a new home). If you would like to know what you are likely to get from the sale of your home, with four to fourteen days of market time, simply fill out the information below and we'll be in touch to give you the valuation. If you take the two month approach to sell your home, you will get less money than if you sell your home in four to fourteen days. We have produced numerous reports proving this and are happy to discuss with you the benefits of working with a real estate company who considers all market information before giving you advice on how to sell your home for top dollar.